There’s a lot to consider when you’re hunting for an all-around great daily bag. You’ve got to have enough room for your essentials, extra pockets or pouches for organizing the little things, and it needs to be sturdy enough to last through whatever weather or travel scenarios you wind up in. The Bomber Barrel Duffel Bag Complete Set meets all of the criteria for a perfect duffel bag. 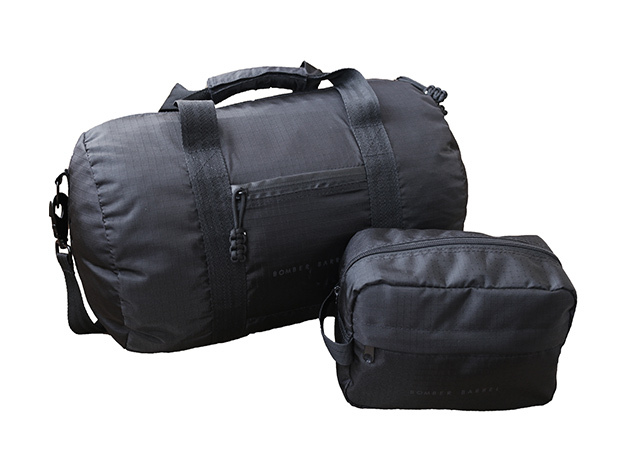 This duffel bag is the most funded bag in Kickstarter’s history and with good reason. The premium, weather-resistant materials protect your bag rain or shine, while padded quick release straps and reinforced handles make this bag comfortable to carry and easy to set down. Inner and outer pockets for small essentials help you organize personal items, and the large interior leaves plenty of room for multiple outfits, workplace must-haves and more. In addition to the Bomber Barrel Duffel Bag, this complete set also includes a travel case for organizing toiletries and other small essentials when you’re on the road. It fits easily inside the duffel, and you won’t have to worry about anything inside getting damaged thanks to the bag’s waterproof zippers, military-grade clips and paracord zipper pulls. Usually, the Bomber Barrel Duffel Bag Complete Set costs $200, but you can snag this bag right now for just $69.99 (65% off).